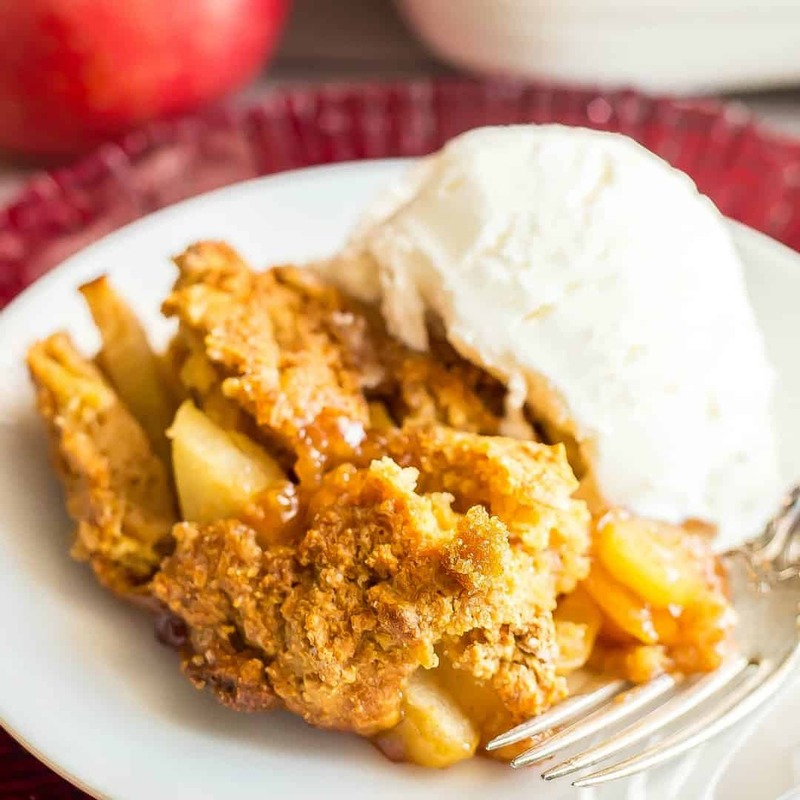 Weight Watchers Apple Cobbler is full of apple and cinnamon flavors and goes perfectly with ice cream for a delicious dessert! When it comes it dessert, Apple Cobbler is always in my top 5 favorites. There’s something so comforting about the combination of spiced apples and crust. It reminds me of being a little girl sitting at the table in my grandma’s kitchen. This Weight Watchers Apple Cobbler is full of those apple and cinnamon flavors and goes perfectly with ice cream. It’s naturally sweetened and made with whole grains for a healthier sweet treat that will surely satisfy. I’m not sure if you knew this, but I’m a huge apple addict. ?❤ I legit eat an apple a day most days of the week. I love the crunch and natural sweetness of apples and they make such a great healthy snack. I also love cooking with apples and making apple-flavored desserts. My whole wheat apple cinnamon breakfast cookies are a morning favorite in our house. And each fall when apples are at their peak season, I look forward to making my easy healthy apple crisp stacks, which are a lightened up and much easier version of apple pie. 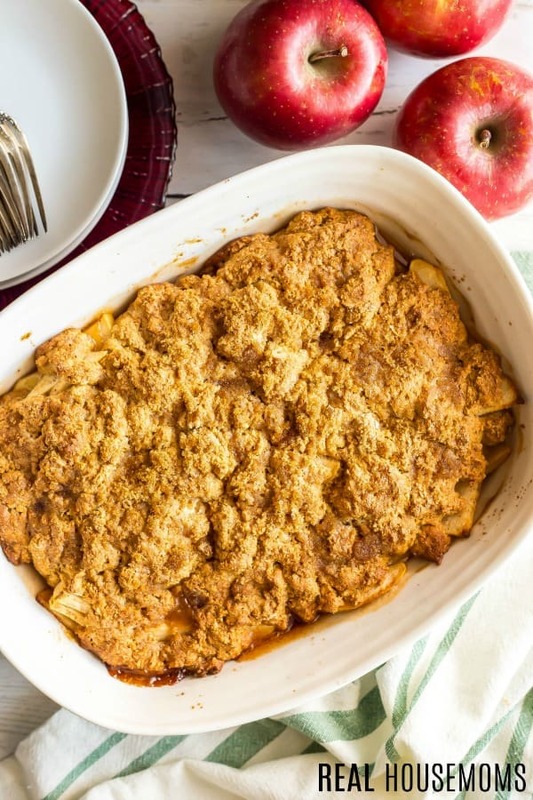 Today I’m sharing my Weight Watchers apple cobbler, which is a year-long favorite in our house and also so easy to make. 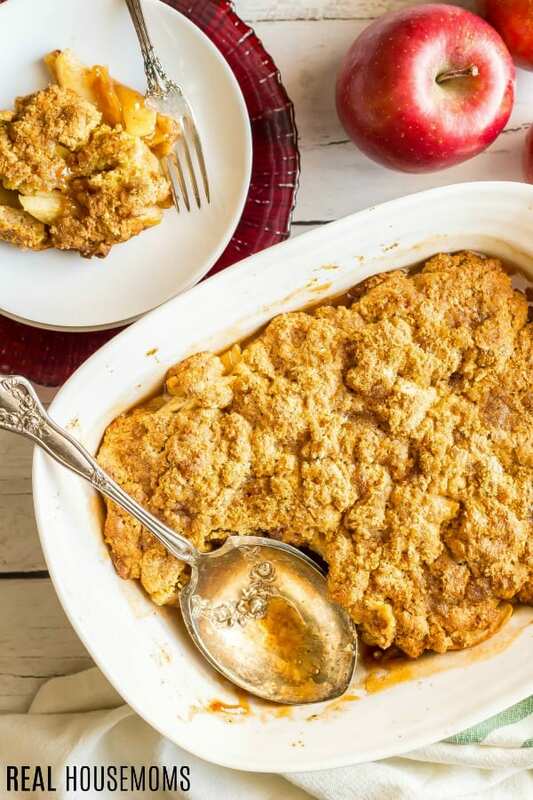 So this apple cobbler is lightened up but I promise it’s every bit as delicious. It’s got just a touch of butter for richness, the perfect balance of cinnamon with a hint of nutmeg and it uses mostly honey for sweetness, which adds depth to the baked cobbler. I also use a little brown sugar to sprinkle on top of the topping, which helps it caramelize in the oven. Oh and that topping! It’s super thick and gets a crunchy coating on top that pairs so well with the tender, soft apples. You’ll be going back for bite after bite! Now, as much as I love the cobbler topping, sometimes I want a healthy apple crisp. The crunchy oat topping calls to me. It’s all about what mood I’m in, cobbler or crisp. Highly recommend adding a scoop of vanilla ice cream on top when serving this cobbler. It’s kind of the perfect combination. Especially when you scoop some of the sauce from the bottom of the casserole to drizzle over top. Swoon! Next time you need a lighter dessert that’s warm and comforting, I hope you’ll give this one a try! 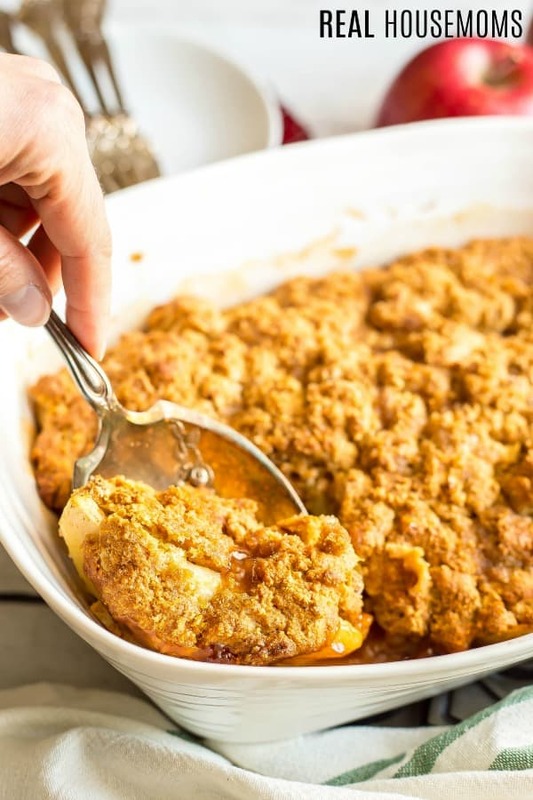 And if you want a set and forget option, this crockpot apple cobbler has your name all over it! Want more Weight Watchers recipes? Place sliced apples in a medium bowl. Drizzle with honey, then add cornstarch, cinnamon and nutmeg. Stir well to coat the apples. Transfer apples to a 9-inch x 13-inch (or 8-inch x12-inch) casserole dish sprayed with cooking spray. In a separate bowl, mix flour, sugar, baking powder, baking soda and salt until well combined. Cut in butter using a pastry cutter or a fork, until the mixture resembles small peas. Pour the batter mixture over the apples in the casserole dish. Sprinkle the brown sugar evenly over the top of the batter. Bake at 375 for 30-35 minutes, until the topping is golden brown and set. Remove and let sit for 10 minutes before serving. I'm Kathryn, a health and nutrition editor, wife, mother of two little kids, and devoted food and home cooking nut. I've got lots of easy recipe and resources to help you get delicious family food on your table! Enjoyed this. It’s not as sweet as most versions of this recipe so could easily pass for breakfast. I like that idea! Thank you Christianne. Would recommend doubling the flour batter. What the recipe calls for only covers about a forth of the cobbler top.